A plant-eating aquatic marine mammal, of the genus Dugong, found in tropical regions. Dugong dugon. The dugong (Dugong dugon) is a large marine mammal which, together with the manatees, is one of four living species of the order Sirenia. It is the only living representative of the once-diverse family Dugongidae; its closest modern relative, Steller's sea cow (Hydrodamalis gigas), was hunted to extinction in the 18th century. It is also the only sirenian in its range, which spans the waters of at least 37 countries throughout the Indo-Pacific, though the majority of dugongs live in the northern waters of Australia between Shark Bay and Moreton Bay. 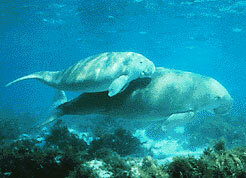 The dugong is the only strictly-marine herbivorous mammal, as all species of manatee utilise fresh water to some degree.